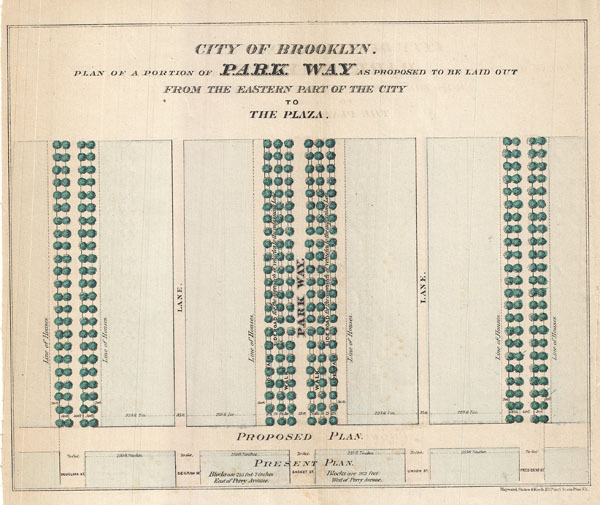 Map of Brooklyn's Eastern Parkway - the world's first Parkway. City of Brooklyn. Plan of a Portion of Park Way as Proposed to be Laid out From the Eastern Part of the City to The Plaza. The world's first parkway was conceived by Frederick Law Olmsted and Calvert Vaux in 1866. The term parkway was coined by these designers as a landscaped road built expressly for 'pleasure-riding and driving' or scenic access to Prospect Park (also designed by Olmsted and Vaux). To these ends, commerce was restricted. The parkway was constructed from Grand Army Plaza to Ralph Avenue (the boundary of the City of Brooklyn) between 1870 and 1874. Olmsted and Vaux intended Eastern Parkway to be the Brooklyn nucleus of an interconnected park and parkway system for the New York area. The plan was never completed but their idea of bringing the countryside into the city influenced the construction of major parks and parkways in cities throughout the United States. This map was first published in the 1868 edition of William BishopÂ's Manual of the Common Council of the City of Brooklyn. Extremely scarce. Bishop, William, Manual of the Common Council of the City of Brooklyn, 1864, 1864.